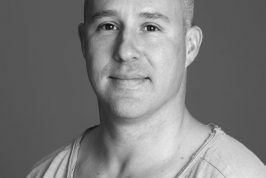 Flywheel training has a century-long history, and our founders started working with flywheel devices for strength and conditioning over a decade ago before founding Exxentric in 2011. Here is Fredrik Correa’s story. The first known study related to flywheel resistance training was conducted at the Laboratory for the Physiology of Gymnastics, University of Copenhagen in 1924, by researchers Hansen and Lindhard (1). They used a flywheel made out of lead and steel to do what all decent muscle physiologists do while no one is watching: measuring force curves during biceps contraction. Hansen and Lindhard do, however, refer to a stationary bike using a flywheel for resistance in a study conducted in 1913 by a colleague from the same institution, professor August Krogh. He is probably the father of using the flywheel in training (2). Krogh, by the way, received the Nobel Prize in 1920 for his work on the function of capillaries. This is, however, not the first documented flywheel device. The Gymnasticon (pictured), a flywheel device invented in 1796 by a Frenchman, Francis Lowndes, was way before that. Since those early days the flywheel has been used in many mechanical applications for the purpose of accumulating kinetic energy, just to re-surface in resistance training in the late 1980s. Back then, many people within the scientific exercise physiology community were trying to solve the problem with atrophy and bone loss in microgravity, i.e. space travel. Steroids, electro stimulation, rubber bands and hydraulics have been tried, but all failed in one way or another. At that time, Swedish scientists with The Karolinska Institutet, one of Europe’s largest and most prestigious medical universities in Stockholm, Sweden, developed a flywheel device that was designed to help astronauts to maintain skeletal muscle strength and mass in space. The project was supported by the European Space Agency (ESA), the National Aeronautics and Space Administration (NASA) as well as the Swedish National Space Board. In 1994, they published a study (3) in which they had designed a flywheel leg extension. They conducted a number of studies in the years after and developed a couple of flywheel resistance training devices similar to traditional strength training devices, like leg curl, leg extension and so on, but with the weight stack replaced by a flywheel. This was when I first found out about flywheel training. I had just finished my studies at the Swedish School of Health and Sport Sciences in Stockholm where I also met my friend and co-founder of Exxentric, Mårten Fredriksson. At that time, we were both working in the same ice hockey club, training elite junior players. I coached 16-17 year-olds and Mårten 18-19 year-olds. We had a lot of discussions about the talented players from different local teams that got recruited into our club in the early junior years. The problem was that they didn’t have any schooling in training, especially regarding the use of free weights. We felt that we spent a lot of time during their four junior years teaching them how to lift instead of improving their physique and performance to the extent that had been possible if they had been better lifters. Since they were strong and able kids it was frustrating that we couldn’t put enough load on them, since their lack of technique didn’t allow it. Shortly after I found out about the flywheel devices I started working on some projects in the lab with the researchers developing those. This was in the Muscle and Exercise Physiology Laboratory at the Karolinska Institute. 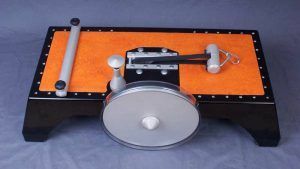 When I was in the lab working on an electromyography (EMG) project related to the traditional flywheel devices, I saw a prototype device made by an engineer named Håkan Eriksson. He worked for the department of Biomedical Engineering at the Karolinska Hospital, just across the road. He was helping the researchers to build all prototypes, but he was also a dedicated ice speed skater. To solve his problem with off-ice training he had built a prototype device consisting of a shaft with a flywheel on a small plate. He used it for high rep; half squats with low inertia trying to mimic the metabolic work in skating. I felt that Håkan’s prototype could provide the basis for a completely new product. So, Mårten and I got together in the lab and discussed the possibility of building a flywheel multi-exercise device based on the prototype, but with more motion freedom. We wanted it to work in a similar fashion as free weights, but use a flywheel for resistance instead. We pitched the idea with some sketches to the research leader, and he liked the idea and we started developing our baby. We started by increasing the height of the box to get the shaft lower to increase the depth in the squat. We increased the area on top to allow more lateral movements and a longer shaft for fitting more flywheels, and so on. When the product was ready, we had put in a countless more hours into this than we had ever imagined. The prototype was working but far from complete, and many improvements still had to be made. However, the lead researcher and his company took a shorter-term perspective and decided to release the prototype as a product into the market. After the release we received considerable feedback consistent with our own thoughts on how to improve the device further and also new ideas. After our time in the research lab, Mårten and I went separate ways. I had my hands full with medical school and graduated from Karolinska Institute in 2006. But we knew that we had started the project to fill the gap for athletes and patients and realized it could be done so much better – it had to be. Over the years, Mårten and I discussed realizing our ideas and suddenly we bumped into Kjell Insulander, who was a producer and a subcontractor of metal parts to other companies. He had an interest in training and also to build a product of his own. So we decided to start Exxentric and started phase two. With our ideas and Kjell’s engineering skills, we could release our next-generation flywheel training device, the kBox 1.0 in 2011. A small batch of the first kBox version sold out pretty fast to high profile customers, making us realize that we will need an experienced manager to handle future growth. We found one in Erik Lindberg who, prior to Exxentric, had held a wide range of management positions in multi-national companies like Apple and Lexmark. Erik is our CEO since a couple of years, overseeing all aspects of our business expansion around the world. After a period of fast growth, Exxentric has now released the third version of our main product, the kBox 3. We have come very far from where we started. The new device offers superior functionality, better looks, much lower weight and a better build quality. We are convinced that we are on the right path, and you should expect to see exciting product news coming from us in the future. 1. Hansen T.E, Lindhard, J. On the maximal work of human muscles especially the flexors of the elbow. 1924. Laboratory for the Physiology of Gymnastics, University of Copenhagen. 2. Krogh, A. Skand. A bicycle ergoemter and respiration apparatus for the experimental stuy of muscle work.Arch. Physiol. 1913; 33:375-395. 3. Berg, HE, Tesch A. A gravity-independent ergometer to be used for resistance training in space. Aviat Space Environ Med. 1994 aug;65(8):752-6. Another version of this text was published on the Freelap USA blog. Read more.